Pepper – 6 to 8 nos. Dry roast Foxtail millet for 3 minutes in a pan. Transfer it to a pressure cooker. Add water, bay leaf, rock salt and a few drops of gingelly oil. Cover the lid and wait for the first whistle. Reduce the flame and let it cook for 8 more minutes. Once the pressure is released, wait for 10 minutes. Then open the lid and fluff the rice with a fork. Keep it aside. Cut the cauliflower and broccoli florets in slightly bigger sizes. Soak them in a hot water with salt for 10 minutes. Later drain the water and wash the florets once. Heat oil in a pan. Add cumin to splutter. Add grated ginger and sauté for a minute. Add pudina leaves and sauté for a minute. Add chopped tomato and turmeric powder and sauté till it becomes mushy. Add cauliflower and broccoli and sauté for few minutes. Then add greenpeas and little bit of water and boil the vegetables till it is 3/4 cooked. Now add the rice and mix well. Pound pepper in a crushing stone and mix that coarse powder in the rice. Squeeze the lemon on top of the rice. Adjust salt as per taste. Garnish it with coriander leaves. Serve it with any raitha. I learnt this recipe from ‘Arockia Unavu’ (Jaya TV show on every Wednesday at 6 p.m.). In the actual recipe, it was said to boil the millet with 1 cup of water and 1 cup of coconut milk. Here I used only plain water as coconut should not be over heated as per Life natural concepts. Another point is Lemon and Coconut should not be taken together in the same meal. Hence I have modified the recipe slightly. 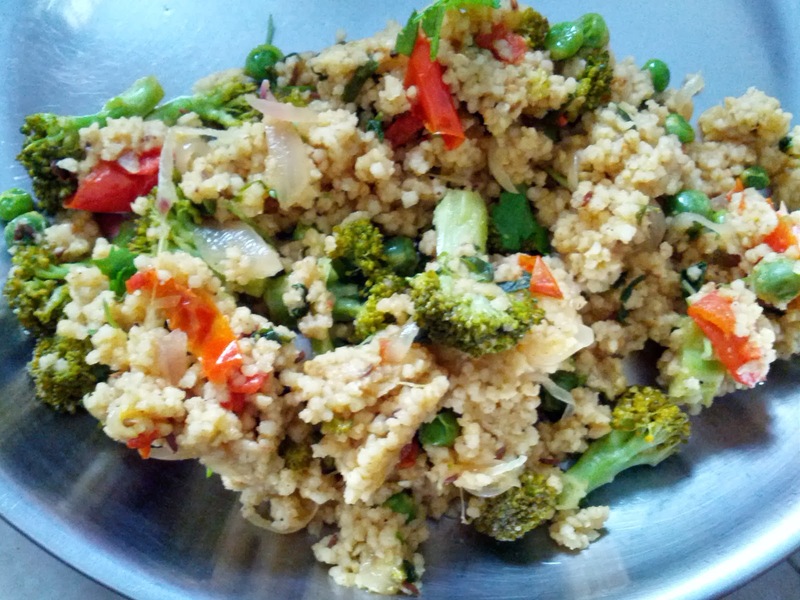 You may use the same recipe with other millets like Kodo, Barnyard and Little millet as well.